Soup and bread go way back. A well baked loaf and a well made soup are a transcendent combination. Through the years soup has become a classic, delicious and nutritious first course. The first Spanish language cookbook was written in the sixteenth century by Ruperto de Nola, a chef to the Spanish ruler of Naples, King Hernando, In it he included a soup recipe calling for almonds and onions. Almost 500 years later and almond and onion soup is still popular all over Spain, often served as a first course at the afternoon meal. The technique used in this soup may remind you of French Onion Soup but the difference is that here the onions are not browned and a lot of almonds are used. It makes for a spectacular tasting soup that you are sure to enjoy. Serve as soon as it comes out of broiler with a sprinkling of the sliced toasted almonds. More slices of the baguette would be good to accompany this soup. Almonds are a wonderdul food,the most nutritious of all nuts. In a nutshell, almonds are very rich in fibre, vitamin E, niacin, biotin, riboflavin, and the minerals zinc, selenium, copper, potassium, phosphorus and iron. Almonds are good groceries for you and this soup is a perfect showcase for them. Enjoy. This soup sounds very interesting and very good. Who would of thought to add almonds. You come up with the best recipes. Not that I can eat them all, but my Hubs sure can. Anthony this is a delicious recipe! I've never made an onion and almond soup but that is surely going to change soon. It sounds utterly delicious! Thanks for the recipe for a new and different soup - and how did you know that my hubby has been asking for an onion soup??? I can't wait to make this version for him (and myself!!)! I would have never thought of putting almonds and onions together in a soup. How interesting. Never heard of Almond and Onion soup, looks like quite the dish. I read thru the recipe....sure it'll be a tantalizing bowl! Soup and bread together is one of my favorite meals. My family is never receptive to it, though. Apparently, I'm the only soup lover in my house. But I am going to try this one. It sounds incredible. Onions and almonds in a soup are a new combination for me ..but I would think this is a better version of the French onion soup!! MY JOURNEY WITH CANDIDA: It must be tough cooking different meals for each other. Maybe I can think up an alkaline meal for the whole family. Regards. LIZZY: Yeah you are right and this soup with cheese is really great. PRIYA SREERAM: Definately worth a try, Thanks. MISHA GERICKE: Ok, you be Julia. You are going to get that stage part, so make a big pot of this for the cast and crew. And break a leg will ya? SUSANNE DRAZIC: If you can put words on paper you can put onions and almonds in soup, and I hope you will. And thanks for your hospitality to my spouse Kathy. SCHMETTERLING WORDS: Even without the alcohol this soup would be wonderful, please enjoy. And happy to hear from you again. PAT HATT: Almond and onion soup is quite the dish, though containing neither fowl nor fish. THE JUNKIE BOOK: This is a lovely soup for sure. Thank You. I've just recently got my hubby to like onions. Making an onion soup might be pushing it... but it does look and sound yum! Almonds are one of my favorite types of nut! SUSAN OLOIER: Some people just don't care for soup, probably resulting from canned,condensed soups in youth. Therefore I try to interest people with soups like this. Before the end of the month, I hope you can interest your family in one of these a-z soups. MALLI: I really like French onion soup too but this is lesser known soup and is also quite good. Thanks for calling. LYNDA R YOUNG: With onions, starting easy is good idea. I believe the almond onion combination might turn out to really impress him. Try not serving him any and then asking him to taste a spoonful of yours. THE GOLDEN EAGLE: From my perspective, which is down to earth, you have good tste in nuts. Thanks for calling. 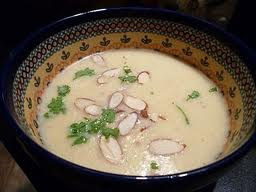 I love soup but have never tried almond soup! Good start to the challenge my friend! Damn it, that sounds absolutely delicious, but alas, I find myself completely out of Gruyere. Also, it's nearly midnight and I might be out of crusty bread, too. Tell you what: I'll start tonight with just the wine, and add the rest of the ingredients tomorrow. This sounds great! I find the biggest problem with almonds to be to try to impart their flavor on other things on account of their subtlety. But this sound as if it could work. It goes on my to do list. ELIZABETH SHERYL: Thank You, it definately is delicious. DUNCAN D HORNE: Yor are a genius with those letters, so therefore are entitled to a bowl of this fine soup. I wish you (and your family) were here, I'd love to serve you some. NATE WILSON: That's ok Nate, start with the wine in a pot, just don't drink it. Don't they have any all-night grocery stores up there? I guess not. I never knew till about 15 years ago that some unique, famous cigar wrapper tobacco was grown in the Conn valley. DEEPS @ NAUGHTY CURRY: Thank You so much for your lovely compliment. The soup is delicious, even without the wine. STEPHANIE: You are most welcome anytime. Second daughters name is Stephanie. PREMALATHA ARAVINDHAN: Thank You for calling, hope you like what you see. HEATNEAT: Yes almonds are a subtle taste, but they go well in this soup and doubly as thickener. If you wanted to enhance the almond flavour somewhere else, gently roast the almonds beforehand.